Brianne Goutal and Fineman. Photo Credit ©Sportfot. Mill Spring, NC – October 20, 2017 – The $35,000 Horseware® Ireland Jumper Classic CSI 5* welcomed a steadfast victory for Brianne Goutal (USA) and Fineman hosted on the Grass Complex at Tryon International Equestrian Center (TIEC). The duo raced to complete the short course in 42.929 seconds, prompting a final victory gallop lap for Goutal and the 2003 Swedish Warmblood gelding (Feliciano x Kotiljong II) owned by Rose Hill Farm. Second place in the $35,000 Horseware® Ireland Jumper Classic CSI 5* was awarded to Beezie Madden (USA) aboard HH Hercules, a 2009 Irish Sport Horse, owned by John Madden Sales, after stopping the timers in 42.961 seconds. Alberto Michan (MEX) rode Gigolo Van De Broekkant, a 2006 Belgian Warmblood gelding (Heartbreaker x Sinaeda) owned by Ilan Ferder and Tal Milstein, rounded out the class with a third place positioning after finishing the jump-off round in 43.195 seconds. “Twenty-one combinations pressed forward to the jump-off, so I was lucky to go kind of in the last part, so I could see the turns and the times and the strides they were doing. In the end, with so many good riders in this class, you had to go really fast to try to catch them,” concluded Michan. The third day of competition at Tryon Fall V brought many of the top hunter riders in the country out to contest the $20,000 USHJA International Hunter Derby track in the George H. Morris Arena, designed by Andy Christiansen. A competitive 23 horse and rider combinations completed the first round, while the top twelve pairs returned to test their skills around the handy course. Schuyler Riley of Wellington, FL and Cleopatra’s Smile posted the highest score, ending their afternoon on a 383. Riley was leading after contesting the first round, but was followed very closely by Hunter Holloway of Topeka, KS, as well as ultimate second-place finisher, Maggie Jayne of Elgin, IL aboard Like I Said, owned by Pony Lane Farm, who finished the day on a 375. Third place went to Tommi Clark of Agoura Hills, CA, riding Stephen Borders Extraordinaire, after earning a final score of 369. The mare, imported in April and owned by Wolfstone Stables & Sales Inc., has guided Riley back into the spotlight in major hunter classes around the country. The day concluded with a strong win for Christina Kelly of Aiken, SC and Eckham Van Het Steentje in the $10,000 Hollow Creek Under 25 Jumper Classic. Emanuel Andrade of Wellington, FL took a sweep of second and third place positions, stopping jump-off timers in 40.378 seconds and two time-faults aboard Bon Jovi, a 2006 Dutch Warmblood gelding (Verdi x Whoopy C) for second place, while Boy IV, a 2007 Oldenburg gelding (Sandro Boy x Samira III), finished in third-place after a securing a time of 72.216 seconds in the first round and accumulating only a single time fault. Brianne Goutal and Onira. Photo Credit ©Sportfot. Mill Spring, NC – May 5, 2017 – Brianne Goutal (USA) and Onira made quick work of the $6,000 Horseware® Ireland 1.45m CSI 2* at Tryon International Equestrian Center (TIEC), as the duo took the class with a jump-off time of 34.64 seconds. Sharn Wordley (NZL) and Famoso D Ive Z captured second place with a time of 35.26 seconds, while Darragh Kerins (IRL) and Silteplait de Circee finished in third after stopping the timers in 38.043 seconds. Goutal and Onira are a veteran combination and have traveled the national and international show jumping circuits for nearly fourteen years together. The 1996 Dutch Warmblood gelding (Nimmerdor x G.Ramiro Z), owned by Remarkable Farms LP, has kept his youthfulness and competitive edge with Goutal piloting from the irons. The duo has maintained a shared desire to win and Onira looked both fit and fresh. She acknowledged the pair’s lengthy career together, noting that the care and respect she and her team have for Onira has helped to keep him happy and wanting to work, even at his older age. The win was an emotional one for Goutal and she described her unique and deep relationship with Onira, which has spanned more than a decade. Wellington, FL – February 8, 2015 – Week five of the 2015 Winter Equestrian Festival, sponsored by Ariat® International, concluded on Sunday with a win for Brianne Goutal (USA) and Ballade van het Indihof in the $127,000 Ariat® Grand Prix CSI 3*. After topping Friday’s $34,000 Ruby et Violette WEF Challenge Cup Round 5, Goutal and the 14-year-old Belgian Warmblood mare (Thunder van de Zuuthoeve x Heartbreaker) continued their winning form into the week’s finale event, held on the beautiful grass jumping field at The Stadium at the Palm Beach International Equestrian Center (PBIEC). Further Lane Farm’s horse, Stellar, was ridden to reserve championship honors by Sophie Michaels. The pair was first and second over fences and won the under saddle. This week was Inclusive’s 2015 WEF debut. “He [Inclusive] was a little nervous yesterday. He used to be a jumper, so he went into jumper mode and got a little fast,” Colvin commented about her horse’s performance. Despite having a long break, Colvin and Inclusive have been working together for the past five years. Although he was a little out of practice the first day, the second day Inclusive was back to his winning ways. “I know him [Inclusive] very well. He is my best friend, he can have his days, but he steps it up in the ring,” Colvin said. “In the handy round I did the skinny trot jump, which was fun for him [Inclusive] because the spookier the jump, the better for him,” Colvin smiled. Looking ahead to next week, Colvin is planning on riding Inclusive in the $100,000 WCHR Peter Wetherill Palm Beach Hunter Spectacular. Colvin has won the class for the past three years and is excited to try and defend her title this year. After WEF, Colvin hopes to qualify Inclusive for the Devon Horse Show and the Indoor Finals. When Colvin is not competing in the hunter ring, she is busy competing in the equitation and jumpers. As the 2014 ASPCA Maclay Finals Champion, Colvin is looking to have similar success this fall in her last junior year. 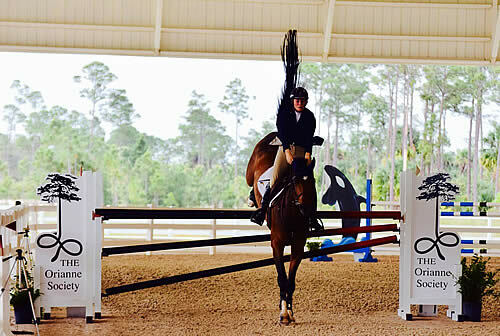 The 2015 Winter Equestrian Festival continues with its sixth week of competition, sponsored by Salamander Hotels & Resorts, on February 11-15, 2015. Week six features the coveted $100,000 WCHR Peter Wetherill Palm Beach Hunter Spectacular, the $85,000 Salamander Hotels & Resorts Grand Prix CSI 3*, and much more. For full results and more information, please visit www.pbiec.com. Brianne Goutal and Ballade van het Indihof. Photos © Sportfot. Wellington, FL – February 6, 2015 – The 2015 Winter Equestrian Festival (WEF) resumed with competition at the Palm Beach International Equestrian Center (PBIEC) on Friday after inclement weather forced the cancellation of Thursday’s classes. The $34,000 Ruby et Violette WEF Challenge Cup Round 5, originally scheduled for Thursday, was held in the afternoon with a win for USA’s Brianne Goutal and Ballade van het Indihof. Alexander Zetterman (SWE) and Flecu finished second and Abigail McArdle (USA) and Cade placed third. Ariat® International, Inc. is the title sponsor of week five CSI 3* competition on February 4-8, 2015. The week will feature the $127,000 Ariat® Grand Prix CSI 3* on the grass jumping field at The Stadium at PBIEC on Sunday, February 8. The weekend also highlights the 6th Annual Great Charity Challenge presented by Fidelity Investments®, which will be the main event on Saturday, February 7, under the lights of the International Arena at PBIEC. Both events will be live streamed at www.COTH.com. The Great Charity Challenge will begin at 6:30 p.m. on Saturday. Watch it LIVE at: http://bit.ly/1DfE5ZK. The $127,000 Ariat® Grand Prix CSI 3* starts at 2 p.m. on Sunday. Watch it LIVE at: http://bit.ly/1KvCJu5. Robert Ellis of Great Britain set the speed track for Friday’s Ruby et Violette WEF Challenge Cup Round 5 with 77 rounds and 17 clear combinations. With her win aboard Remarkable Farms LP’s Ballade van het Indihof, Brianne Goutal broke Eric Lamaze’s four-week hold on the series. The defending winner had one rail down to finish out of the money. Although other riders were faster, Goutal’s early clear round, fifth in the order of go, would prove unbeatable. Lamaze went right before her, fourth in the order, and it was no mistake that Goutal crossed the timers just fractions off of his time. She watched his every step before entering the ring, and followed the same track. Her resulting time of 59.90 seconds held on through over 70 rounds for the win. Sweden’s Alexander Zetterman and Flecu finished second, almost three seconds slower in 62.54 seconds. Goutal’s winning mount, Ballade vent het Indihof, is a 14-year-old Belgian Warmblood mare (Thunder van de Zuuthoeve x Heartbreaker) that the rider has owned for several years, but had a long break from showing. She finished third in the $125,000 Trump Invitational Grand Prix, presented by Rolex, to kick off the season in January and has maintained her top form. Goutal praised course designer Bob Ellis on a great track that saw rails in many different places for some of the top horses and riders on Friday. Goutal will jump Ballade van het Indihof again in Sunday’s $127,000 Ariat® Grand Prix CSI 3* on the grass field at The Stadium at PBIEC. After a great finish on the grass at the Trump Invitational, she feels her horse is ready to take on the new venue. 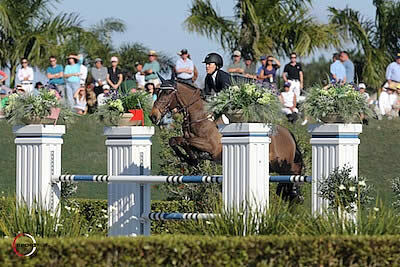 Also competing on Friday, the $6,000 Spy Coast Farm 1.40m Speed Challenge was held with two sections of competition. Adam Prudent and Patrick Flin and Plain Bay Sales’ Vasco won Section A in the International Arena. Laura Chapot and The Edge’s Out of Ireland won Section B in the Mogavero Ring. Despite a rainy day on Thursday, Lynn Rogers, from Long Island, NY, and her own horse, Blue Point, were in winning form. Rogers and Blue Point stayed consistent throughout the day and finished first, second, and third over fences. With only one day of competition, Rogers ended up as the champion of the Camping World Adult Amateur Hunter 50 and Over Section A.
Deborah Perkins and her own horse, Kaepernick, topped two of the over fences classes to finish as reserve champions of the Camping World Adult Amateur Hunter 50 and Over Section A.
Rogers bought Blue Point when he was four years old and has been competing with him for the past three years. “I was looking for a three-foot hunter and my trainer, Tommy Serio, had Blue Point in the barn. Tommy said he [Blue Point] was too young for me, but I wanted a horse just like him. After a week Tommy let me ride Blue Point, and we just hit it off!” Rogers explained. After spending a year showing in the 2’6″ hunters, Rogers and Blue Point moved up the 3′ hunter division. Since competing in the Adult Amateur Hunters, Rogers and Blue Point have enjoyed numerous top ribbons. Last year, Blue Point was the WEF reserve circuit champion in the Adult Amateur Hunters 50 and Over and started off this year as champion of the Adult Amateur Hunters 50 and Over at WEF 1. When Blue Point is not competing in the show ring, he enjoys going trail riding. “He is the best trail horse I’ve ever had!” Rogers smiled. 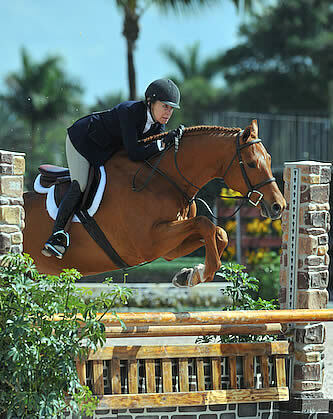 Now competing at WEF for over 10 years, Rogers is still enjoying her winter months in Florida. “I like the footing, the nice jumps, and of course the weather. The reason I still show is because I like jumping these courses,” Rogers said. Competition continues in the International Arena on Saturday with the $34,000 Suncast® 1.50m Championship Jumper Classic during the day session and the 6th Annual Great Charity Challenge, presented by Fidelity Investments®, in the evening. Hunter action continues with the Shamrock Ventures Amateur-Owner Hunter 3’3″ 18-35 in the E. R. Mische Grand Hunter Ring. For full results and more information, please visit www.pbiec.com. Wellington, Fla. – Clear rounds were the order of the night on Friday evening as 12 teams went to task over Steve Stephen’s 12-obstacle track in the Furusiyya FEI Nations Cup presented by G&C Farm, the feature competition of CSIO4* Wellington. The Hermès U.S. Show Jumping Team headed into the Palm Beach International Equestrian Center’s International Arena for the two-round competition, held in conjunction with the FTI Consulting Winter Equestrian Festival, looking to secure a top finish in America’s only Nations Cup. The team of McLain Ward, Brianne Goutal, Laura Kraut, and Beezie Madden jumped to a third-place finish on a score of 12 faults. While the Hermès U.S. Show Jumping Team was looking to start their 2013 campaign with a win on home soil, Chef d’Equipe Robert Ridland was pleased with his team and their resilience. Jumping in his customary lead-off position, Ward (Brewster, N.Y.) and Sagamore Farms’ Rothchild produced an immaculate clear in round one to start the night for the United States. In round two, the two-time Olympic Team Gold medalist and 13-year-old Warmblood gelding returned with an eight-fault trip after lowering the heights of the bicycle at six and the final oxer, fence 12. Goutal (New York, N.Y.) jumped in the second spot for the U.S. with Remarkable Farms’ 13-year-old Selle Francais gelding, Nice de Prissey. In the first round, the pair jumped a four-fault trip after rolling a pole jumping out of the double at nine. In their return trip to the International Arena, they appeared to be on track for a clear round but again were plagued by a rail at fence nine, faulting at the A element in round two. Kraut (Royal Palm Beach, Fla.) and her Team Gold medal-winning partner from the 2008 Olympic Games, Cedric, were the third combination to head into the International Arena for the U.S., completing a faultless round in their first trip. Cherry Knoll Farm, Inc.’s 16-year-old Holsteiner gelding was poised to join the double clear list but barely dipped a foot in the open water at 10, resulting in a four fault effort for the second round. Anchoring the U.S. effort on Friday night were reigning FEI World Cup Final champions, Madden (Cazenovia, N.Y.) and Simon. Abigail Wexner’s 15-year-old gelding looked on track to jump a clear, tidy round until coming a bit strong to 11 and lowering the oxer at the A element, resulting in a four-fault effort. The veteran pair returned to the International Arena for a second time and never looked in doubt of a clear round as they cruised faultlessly over Stephen’s track. On Friday, the U.S. also earned vital points in qualifications for the Furusiyya FEI Nations Cup Jumping Season Series Final. Among countries from the North and Central America and the Caribbean Islands regions, the U.S. earned 90 vital points towards qualifying for the Series Final in October. To learn more about the Furusiyya FEI Nations Cup Jumping Season, visit: http://fei.org/fei/events/fei-nations-cup-series/furusiyya. Nations Cup competition continues Saturday with the top Young Riders, Juniors, and Child Riders contesting FEI Nations Cups presented by Hollow Creek Farm. The first round of Young Rider competition kick-off the youth showcase at 1pm ET. 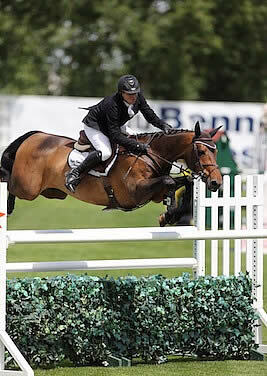 For more information about CSIO Wellington, visit: http://www.equestriansport.com/. Wellington, Fla. – The Hermès U.S. Show Jumping Team heads into the Furusiyya FEI Nations Cup presented by G&C Farm looking to repeat its victory from last year and secure its sixth win in its home Nations Cup. A total of 12 teams are set to go head-to-head on Friday evening at the Palm Beach International Equestrian Center during the feature of CSIO4* Wellington, held in conjunction with the FTI Consulting Winter Equestrian Festival. Two members of the last year’s winning team, Laura Kraut and Beezie Madden, return in 2014 with rising star, Brianne Goutal, and two-time Olympic Gold medalist, McLain Ward, rounding out the U.S. effort. Chef d’Equipe Robert Ridland will lead the U.S. in its quest for victory on home soil. The U.S. has drawn sixth in the order for Friday’s Furusiyya FEI Nations Cup presented by G&C Farm; the first round of team competition gets underway at 7pm ET. Brianne Goutal (New York, N.Y.) will ride Remarkable Farms’ Nice de Prissey. Goutal made a name for herself when she was still in the junior ranks by completing a sweep of the four major U.S. equitation titles, which included the 2004 Platinum Performance/USEF Show Jumping Talent Search Finals-East, the 2004 Washington International Equitation Classic Finals, the 2005 USEF/Pessoa Hunter Seat Medal Finals, and the 2005 ASPCA Maclay National Championships. She has continued to demonstrate winning form in the jumper ring and was honored with the 2007 Maxine Beard Award, in addition to jumping on multiple U.S. Nations Cup teams. She heads into Friday’s Nations Cup competition on strong form, having placed fourth in Adequan Grand Prix CSI4* a week ago. Laura Kraut (Royal Palm Beach, Fla.) will ride Cherry Knoll Farm, Inc.’s Cedric. Cedric is a 1998 Holsteiner gelding. Kraut brings a wealth of experience to the U.S. effort after jumping on numerous Nations Cup teams, including representing the United States at the 2000 Olympic Games and winning Team Silver at the 2006 FEI World Equestrian Games. With Cedric, she helped the U.S. to the Team Gold at the 2008 Olympic Games, in addition to representing the United States at the 2010 Alltech FEI World Equestrian Games. The two-time Olympian will look to showcase the form that earned a third place in the overall standings of the 2013 Longines Global Champions Tour after winning in Wiesbaden with the diminutive grey gelding. The pair also helped the U.S. to jump to a second-place finish in the Furusiyya FEI Nations Cup at CSIO5* Rotterdam. Beezie Madden (Cazenovia, N.Y.) will ride Abigail Wexmer’s Simon. Madden enters the 2014 season as the reigning USEF Equestrian of the Year and FEI World Cup Final champion. The three-time Olympic medalist (Team Gold in 2004 and 2008 and Individual Bronze in 2008) and Team and Individual Silver medalist from the 2006 FEI World Equestrian Games was a major contributor to the United States’ success in 2013. In addition to helping the U.S. team win in Wellington, she aided in an American Consolation Round victory at the Furusiyya FEI Nations Cup Jumping Final at CSIO5* Barcelona with her World Cup champion, Simon. With Cortes ‘C’, she contributed to second-place Nations Cup efforts in Rotterdam and Hickstead and a third-place U.S. finish in Dublin. Ward also brings a wealth of experience to the U.S. effort in Wellington as he joins his Gold medal-winning teammates from the 2008 Olympic Games, Kraut and Madden. Additionally, his resume boasts earning Olympic Team Gold in 2004, Team Silver at the 2006 FEI World Equestrian Games, and a second-place finish at the 2009 Rolex/FEI World Cup Final in Las Vegas. Ward and Rothchild were vital members for the U.S in the Consolation Round victory at the Furusiyya FEI Nations Cup Jumping Final, second-place efforts in Spruce Meadows and Hickstead, and a third-place finish in Dublin. They head into Friday’s Nations Cup competition on strong form after earning a fourth-place finish in the Fidelity Investment Grand Prix and a seventh-place finish in the FEI World Cup Grand Prix CSI-W5* presented by Rolex this year in Wellington. The Furusiyya FEI Nations Cup presented by G&C Farm is doubly important for the U.S., as not only will the team look to secure victory in the only Nations Cup held in America, but also a strong result will be vital in qualifying for the Furusiyya FEI Nations Cup Jumping Season Series Final in October. Spectators and fans in attendance at the $75,000 Furusiyya FEI Nations Cup presented by G&C Farm are invited to a Team USA Nations Cup Pep Rally Reception hosted by the USET Foundation and the USEF from 6-7pm on Friday evening. To learn more about this event, visit: http://www.usefnetwork.com/news/10923/2014/2/11/junior_and_pony_riders_invited_to_g.aspx. Watch the Furusiyya FEI Nations Cup presented by G&C Farm on FEITV.org. Brianne Goutal and Nice De Prissey. Photo by Rebecca Walton. Ireland’s Alan Wade presented many tests on the Grand Prix Field for today’s riders, including an open water, a skinny fence, a tall plank vertical, a vertical-oxer double combination, and an oxer-oxer-vertical triple combination. Ten of the original 36 starters advanced to the jump-off. For the tiebreaker, competitors began over a new oxer-vertical bending line to a tall vertical and last two obstacles in the triple combination. Then they made a sharp roll back to a single over, bending to a tall vertical and finishing away from the gate over a wide oxer. Tracy Fenney was the first in the ring during the opening round, and her faultless round meant she was the first in the ring for the tiebreaker with MTM Timon, owned by MTM Farm of Flower Mound, TX. The long-time partners were able to complete another perfect course, breaking the beam in 40.75 seconds to put the pressure on the remaining riders. Brianne Goutal and Nice De Prissey, owned by Remarkable Farms LP of Royal Palm Beach, FL, were ready to answer the challenge when they stepped on to the Grand Prix Field next for the short course. Utilizing her mount’s large stride, Goutal was able to race quickly to each obstacle and leave each rail untouched. They sped through the finish line in 40.18 seconds to capture the early lead. Although Beezie Madden’s mare Coral Reef Via Volo, owned by Coral Reef Ranch of Rancho Santa Fe, CA, is one of the smaller horses on the circuit, she has a large stride and Madden was able to leave out strides in lines to stay right on Goutal’s heels. Unfortunately, she laid on the gas to the final oxer and incurred four faults, and although her time of 39.65 seconds was faster, the reigning World Cup Champion had to settle for the third place award. Charlie Jayne was just 2/10ths of a second slower than Madden with Chill R Z, owned by Maura Thatcher and Alex Jayne of Elgin, IL, and with an error at the vertical before the last fence their four-fault round would place fourth in a time of 39.86 seconds. With horses of a similar size and speed, Kent Farrington and Uceko, owned by RCG Farm of Ridgefield, CT, tied with Katie Dinan and Nougat Du Vallet, owned by Grant Road Partners of New York, NY, for the fifth place honors after they each lowered the height of a fence and broke the beam at 40.97 seconds to round out the top six finishers and seal Goutal’s victory. The next stop for Goutal will be the New Albany Classic, and she hopes to qualify for the team at the 2014 Alltech FEI World Equestrian Games in Normandy, France. The American Gold Cup has proved to be one of the best events in the United States for many years, with the country’s top horse and rider competitions vying for the winning title and the opportunity to have their named on the prestigious trophy. This year, Brianne Goutal’s name will be added to the list of winners for her incredible effort during today’s international jumping competition. 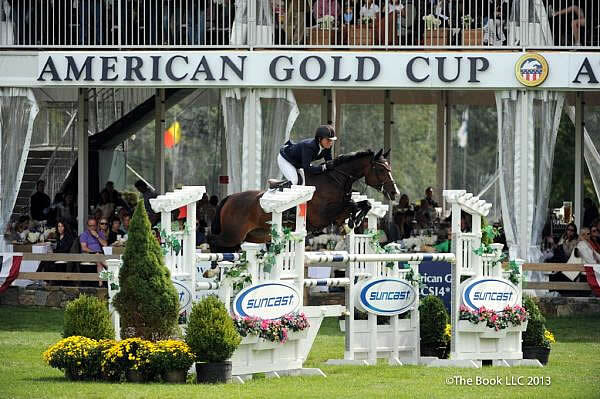 For further information, visit: www.stadiumjumping.com or www.theamericangoldcup.com. Don’t Miss the Televised Broadcast. 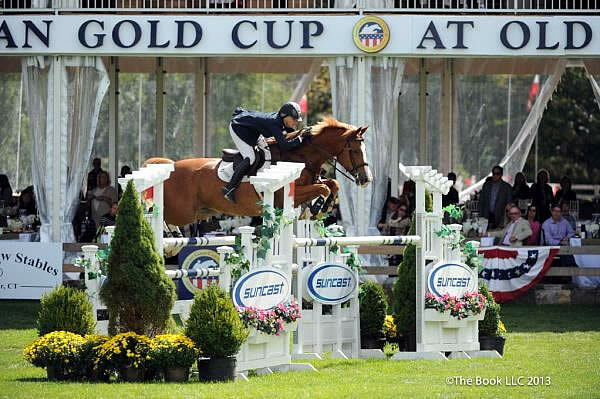 The 2013 American Gold Cup, Presented by Suncast, will be broadcast on NBC Sports Sunday, September 22 at 4:30 p.m. EST. Brianne Goutal and Onira. Photos © Spruce Meadows Media Services. Calgary, AB – June 29, 2013 – The $50,000 RBC Financial Group Cup 1.60m was the highlight event of the day and fans saw Brianne Goutal (USA) ride to victory with her veteran partner Onira. In the All Canada Ring, Shane Sweetnam and Fineman were the only clear round to win the $25,000 Direct Energy Derby 1.45m. Today’s competitions were the start of weekend competition for the ‘Canada One’ Tournament in the Spruce Meadows Summer Tournaments. The ‘Canada One’ Tournament wraps up tomorrow with the $100,000 Esso Challenge, the third FEI World Cup qualifier to be held at Spruce Meadows this summer. Admission and parking are complimentary for this week. There were 20 entries in the $50,000 RBC Financial Group Cup 1.60m, and nine were clear in the first round and moved on to the jump-off. The riders competed over a course designed by Michel Vaillancourt of Canada. The trailblazer in the competition was Reed Kessler (USA) on Mika, who was first to go in the first round and in the jump-off. They were clear in 40.69 seconds, which would hold up for fifth place. Jonathan McCrea (USA) and Colorado had the second fence down for four faults in 44.13 seconds. They would finish in eighth place. Jonathan’s wife, Christine McCrea (USA), was next in on Zerly. They took an early lead with a clear round in 38.73 seconds, but they would have to settle for fourth place at the end of the jump-off. Enrique Gonzalez (MEX) and Quilebo D Tillard had two fences down in 38.15 seconds, which would finish in ninth place. The lead changed hands with the next horse in, Carlos VHP Z ridden by Nick Dello Joio (USA). They set the new time to beat at 38.61 seconds and they finished in third place. McLain Ward (USA) and Zander had a bead on the lead and finished with the fastest time in the jump-off in 37.21 seconds, but it came at a price with four faults at jump 11a. Kirsten Coe (USA) and Calypso were the next to bring the winning time down. They galloped through the timers in 38.41 seconds and finished in second place. Jos Verlooy (BEL) and Domino were also clear, but with a slower time of 40.74 seconds, they would slot into sixth place. It all came down to the last rider in the ring. And although she said she “hates going last,” Brianne Goutal was able to show how it’s done with her 17-year-old partner Onira, a Dutch Warmblood gelding by Nimmerdor x Ramiro Z. They zipped around the turns and stopped the clock in 38.15 seconds for victory. Onira is owned by Goutal’s Remarkable Farms LP and she has been riding him for 10 years. They have risen through the ranks together from the junior jumpers to the 1.60m level and have competed at the FEI World Cup Finals together. There were 26 entries in the $25,000 Direct Energy Derby 1.45m, but only one was able to find the path to a clear round. Shane Sweetnam (IRL) rode Fineman, a 10-year-old Swedish Warmblood gelding by Feliciano x Beach Boy, to a quick round with no faults in 112.098 seconds. Fineman is owned by Sweetnam’s Sweet Oak Farm and he only started riding him three weeks ago. With just one time fault, Katie Dinan and Couletto K James placed second in 124.489 seconds. Third place went to Andres Rodriguez (VEN) with Elatrice, who had four faults in 110.516 seconds. The course was designed by Anthony D’Ambrosio and featured 17 numbered obstacles. Fineman was previously ridden by Sweden’s Maria Gretzer. After arriving in the United States where Sweetnam is based, he and Sweetnam showed in Kentucky, placing third in the grand prix. Sweetnam arrived at Spruce Meadows on Wednesday. Fineman easily handled today’s course with fluidity, and although the grob was the second to last obstacle on a long course, Sweetnam was thinking more about the final oxer. “The last fence I was little bit worried about. I think a lot of people struggled with it. It was a big oxer and the horses were tired at that stage and flat. But he jumped it very, very well,” he said. Sweetnam is aiming Fineman for the $140,000 Cenovus Energy Classic Derby next week. “It’s a different story, but I think he’s a very good horse so hopefully we can have a go at it. He has a lot of ability,” Sweetnam said. The ‘Canada One’ Tournament concludes tomorrow with the $33,000 West Canadian Cup 1.50m and the highlight competition of the week, the $100,000 Esso Challenge 1.60 CSI-W in Meadows on the Green. For full results and more information, please visit www.sprucemeadows.com. Wellington, FL – January 27, 2013 – Week three of the FTI Consulting Winter Equestrian Festival (FTI WEF) concluded with an exciting $50,000 CSI 2* Grand Prix on Sunday afternoon held on the grass derby field at The Stadium at The Palm Beach International Equestrian Center (PBIEC). 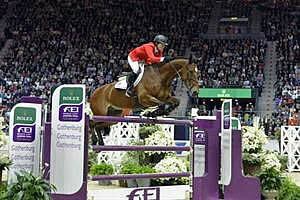 The class saw a win for U.S. rider Brianne Goutal and Remarkable Farms LP’s Onira in a four-horse jump-off. Todd Minikus (USA) and Macoemba finished second, Laura Kraut (USA) and A. Lebon’s Jubilee d’Ouilly were third, and Luis Larrazabal (VEN) aboard Anabel Simon’s G&C Sacramento placed fourth. Uliano Vezzani of Italy was the course designer for week three’s international show jumping competition in Wellington. In Sunday’s $50,000 CSI 2* Grand Prix, Vezzani set the track on the beautiful grass field for 46 competitors and only four were able to clear the course without fault. The bogey fence, a tall wavy-plank vertical off of a tight left-hand turn came down for the majority of competitors, but there were many other rails around the course as well.